Sundays evenings mean one thing – Top Gear on the TV and a bowl of homemade soup and homemade bread to eat. I try to try new soups as often as possible, and also try differnet breads, although, naturally we have our favourites which we return to time and again. A couple of things came together this week to produce this soup. At work, one of my colleagues brought in a leek and potato soup for her lunch. It was homemade, and she ate her way through it with much enthusiasm. Unfortunately, to me it looked and smelled like dirty dishwater, and this made me determined to make something better. A year ago, I would have told you that I didn’t like leeks, but then the Veg bloke at the farmers market gave me a couple, and as I abhor waste I decided I had to use them. So I cooked dinner one night (I can’t even remember what it was) but came to the conclusion that leeks are actually rather good! Anyway, the quest for a decent leek and potato soup had begun. I consulted with the inlaws, friends and family, and also the BBC food message board. 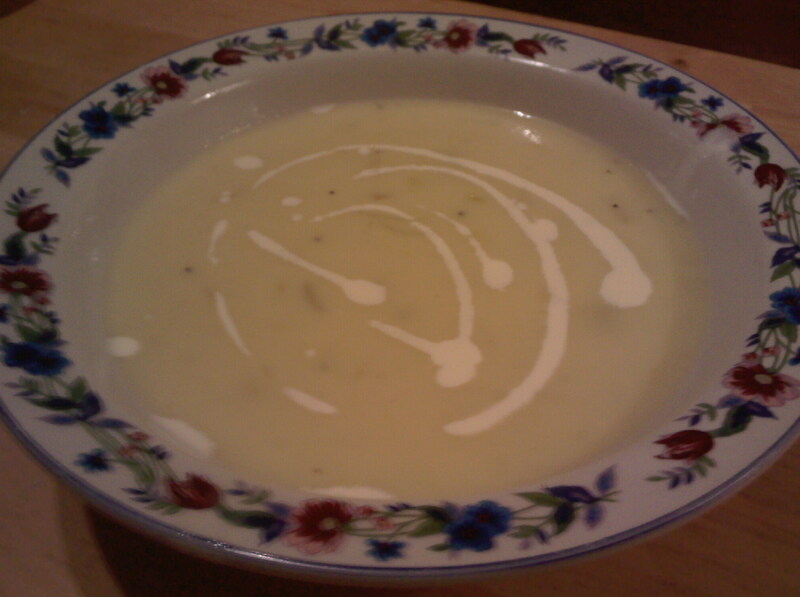 The soup had to be creamy, thick, be a simple leek and potato soup, and above all, it had to be really tasty and filling. Eventually I decided that this recipe by Darina Allen was the one. It came recommended by someone I trust, looks thick, creamy and not at all like dishwater, and contains leeks, potatoes, stock and very little else. The one thing I did differently was I blitzed only half of it to smoothness, mixing in the other half to create a chunky creamy soup. It got a huge thumbs up, and is definitely one I’ll be doing again. To go with the soup I made caramalised onion bread. I make the dough in my bread machine, then shape it, let it rise and cook it in the oven. 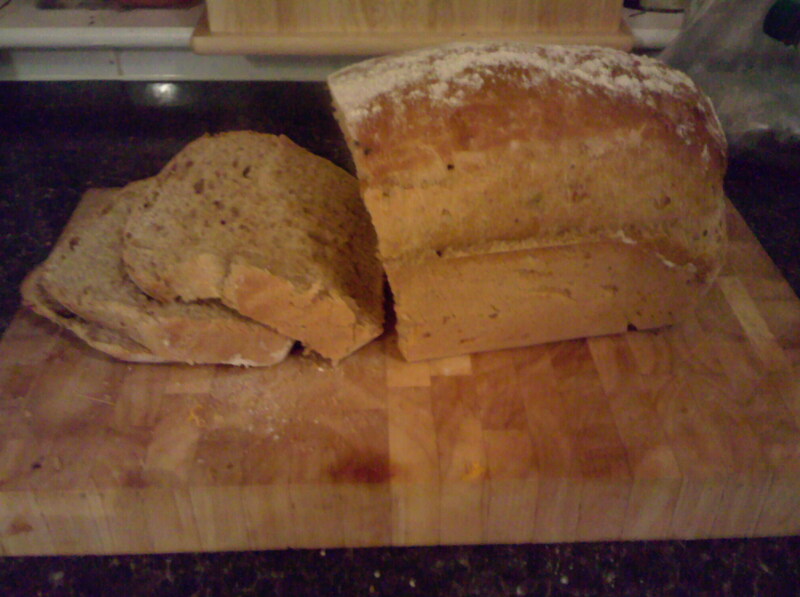 To me this provides the best of both worlds – fresh, home-made bread, but the bread machine does the hard work for me. The caramalised onion bread is simple – chop 2 onions and gentry fry in butter until they are caramalised (not burnt) let them cool. Make a normal white loaf, and add in the onions for the last 10 mins of mixing. Make and shape as usual. here’s the pics of the soup and the bread….